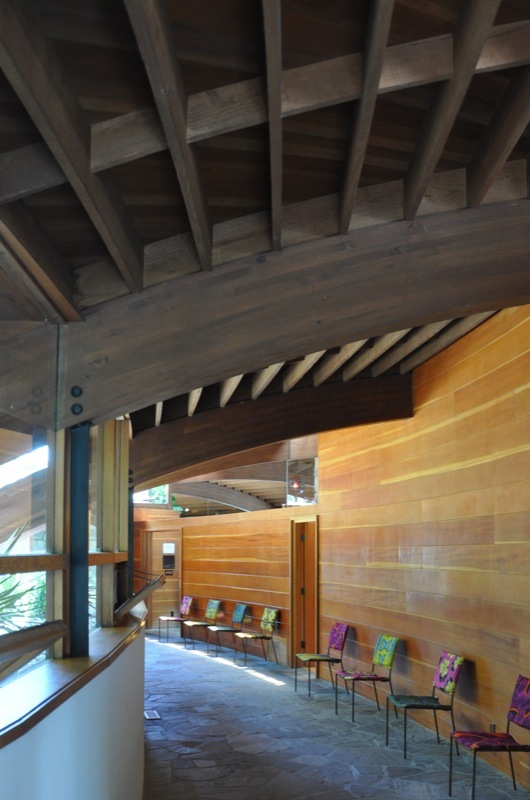 We continue our exploration of the work of John Lautner, in celebration of what would have been his 100th birthday this month, with our 3rd installment from last weekend's tour: The Schwimmer House, from 1982. With this house, we see a departure from the hexagonal and triangular geometries we saw in the Jacobsen and Harpel houses. Instead, Lautner works with circular geometry in this project. Like all the houses on the tour, this house is in the hills, and has spectacular views. 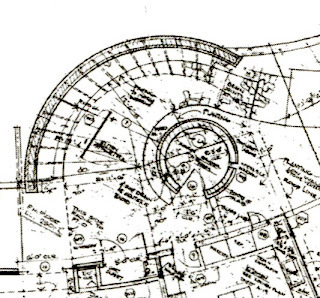 You can see from the plan that the house is designed along a series of concentric arcs. 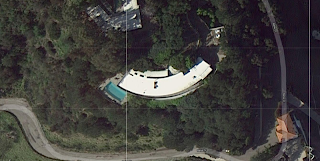 The outermost side of the arc, which is the south side of the house, faces the view. The innermost arc is towards the hillside, i.e. not the view. 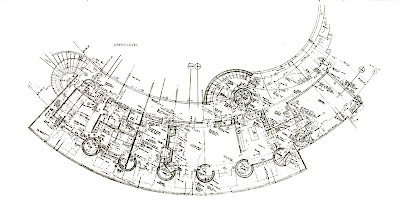 There are other many other circles and arcs employed in different ways throughout the design. The entrance is a sequence of both concentric and eccentrically arranged circles and arcs, which create a curving walkway to the front door. 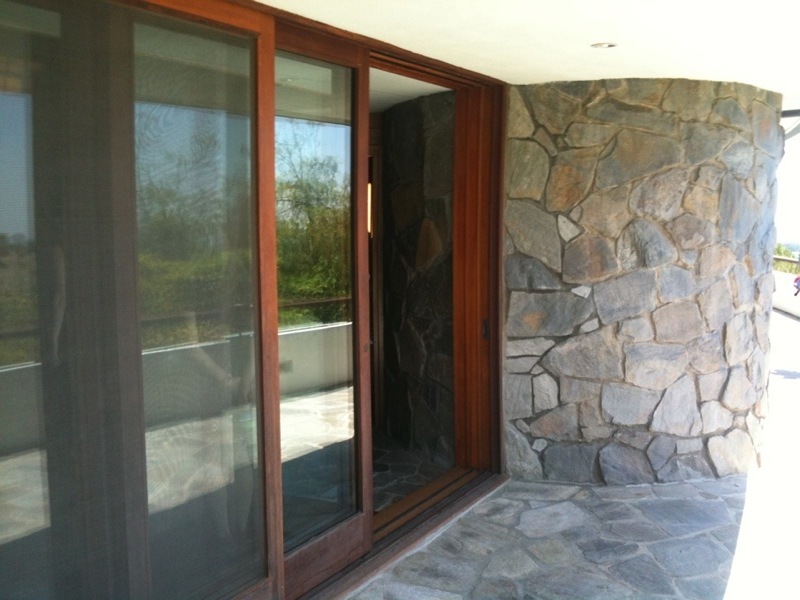 At the middle of this sequence is a stone cylinder that contains the powder room. 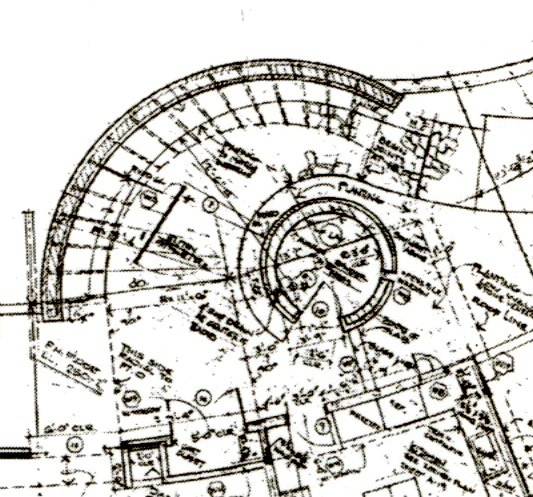 Lautner's use of these circular motifs isn't restricted to the plan. 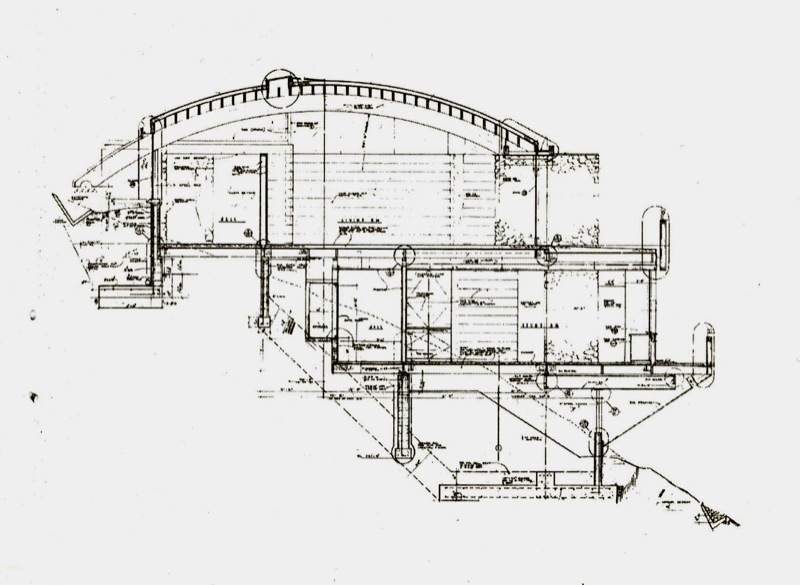 He pushes the concept one step further and uses it in section also, by curving the roof beams. 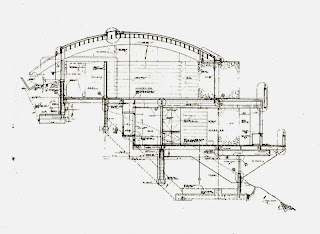 Thus, we have a curved plan combined with a curved section. And now, another video. This shows the living room, hallway from outside the living room, and the study, which is the next room along the hallway after the living room. The living room and study have back-to-back fireplaces that are carved out of the same masonry mass. This one is just over a minute long. Turns out that the stone cylinder, or turret, at the entry, is like a bit of architectural foreshadowing. All along the outer curving arc of the plan (the view side), there are a series of these same stone turrets. They serve as part of the structural system of the house, supporting the roof beams. Also, each one is a little room with a different function, depending on which larger room it is adjacent to. In the plan detail above, the turret at right is the pantry for the kitchen; the one at the center houses the wet bar for the living/dining room; at the left it is a place to keep wood for the massive stone fireplace next to it. Here is the wet bar. There is a curtain in the doorway to the bar, made of very fine individual bronze chains hanging from a rod (another nod to the Medieval, perhaps). You can also see the roof beam springing to the right off the top of the stone. At the exterior, the space between turrets is made up of sliding wood and glass doors, and the depth of the turrets gives each room ample privacy. Notice also how the overhang provides the perfect amount of shade at the height of summer. The curved downstairs hallway is just as lovely as the stair or the rest of the house. Sticking with the theme, the turrets extend to the lower level where they are bathrooms. I especially love the meticulous detailing whereby this door jam between two adjoining rooms downstairs is set into the stone. Underneath the house, the turrets re-emerge and anchor the whole thing into the hillside. I wish I had a view of this from a position floating in midair out in front of the house, with the brush cleared away so you could see it. Sometimes I wonder what Mr. Lautner would think of some of the things people put in his houses today. I wonder whether he would be outraged or just chuckle. I saw this and I chuckled.